The Disney Traditions collection by Jim Shore combines the magic of Disney with the time-honored motifs of folk art. Here, Ariel lovingly accessorizes her father, King Triton, in this colorful scene from The Little Mermaid, perfectly embodying her role as daddy's little princess. 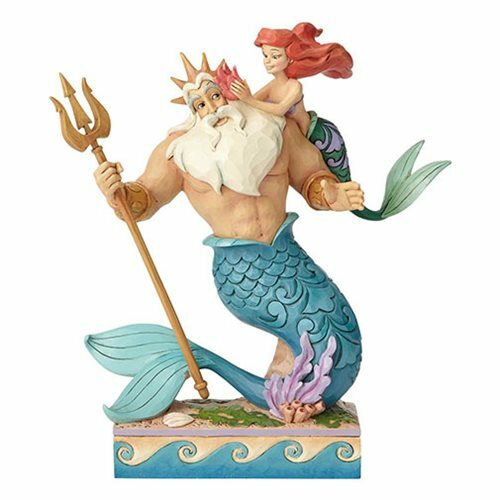 Handcrafted and hand painted, the Disney Traditions The Little Mermaid Ariel and Triton Daddy's Little Princess Statue by Jim Shore measures about 9 3/4-inches tall 6 3/4-inches wide x 3 1/2-inches long and is sculpted from high-quality stone resin for a lifetime of love. It's an ideal gift for daddy's girls and Father's Day alike!